Research shows that kids who spend time outside benefit longterm. Forest schools offer foraging and more as part of the curriculum. The Wild Roots Forest School kicks off the school year with the same ritual every fall. 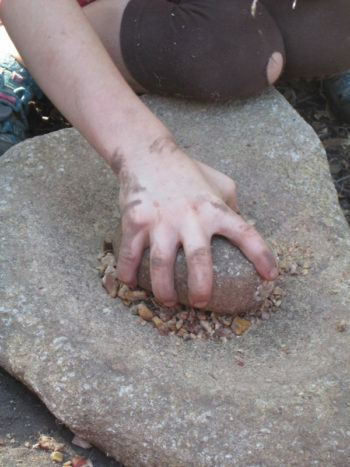 First, the children and teachers crack open foraged, dried acorns and then grind and sift them into a fine flour. Then, all the families come together to bake a giant communal loaf of bread in the shape of a dragon. “The children are not only having the experience of eating; they have to engage in a relationship with it to eat it,” says Lia Grippo, director of the school, which has locations in both Santa Barbara and Bishop, California. Students at Wild Roots range in age from two-and-a-half to seven years old. 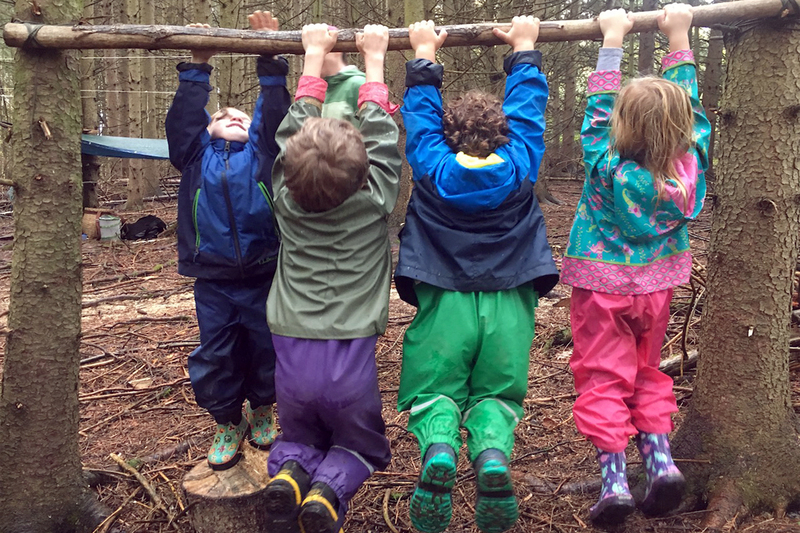 Forest schools, also sometimes known as nature schools, come in a number of shapes, sizes, and iterations, but the essential idea is that young children spend the majority of their days outside in nature. The original forest schools began in Denmark in the 1950s and Sweden soon followed. Parents who choose forest schools do so because they believe in the positive effects nature has on children. And there’s research to back this up. A recent study from Denmark showed that children who grow up surrounded by nature have up to a 55 percent lower risk of developing mental illnesses later in life. Another study out of Barcelona found that children whose schools have more green space had higher cognitive development. And there are many other tangible benefits for children when they spend time in nature, such as better physical health and social relationships with one another and a greater sense of independence. There are currently around 100 forest schools in the U.S. Some offer a combination of indoor and outdoor spaces, while others take place entirely outside, whatever the weather. Most of these are for young children of pre-school and kindergarten age, although there are programs for older, homeschooled children as well. A day at forest school may include a hike, cooking lunch over an open fire, collecting leaves, identifying plants, or picking berries. 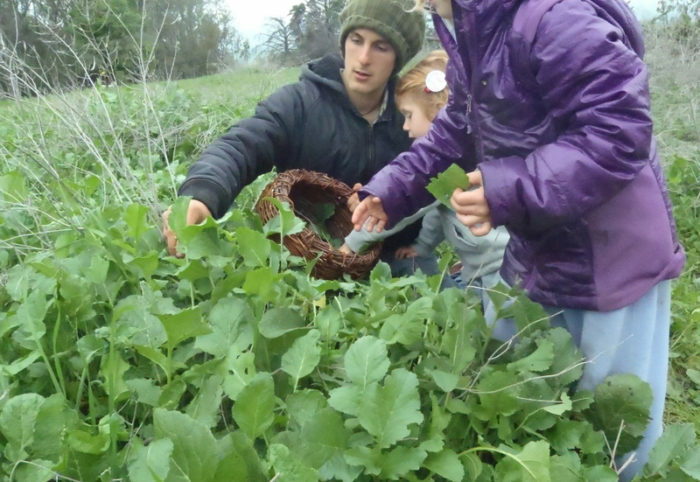 And many are now teaching kids to forage for wild edibles. “If you’re going to have an intimate relationship with nature, that requires all of the senses, and it requires knowing that our very survival and sustenance is completely interwoven with the land that we live on,” says Grippo. She grew up in Latvia when it was part of the Soviet Union and says her family foraged as a way to connect with nature and to supplement their diets when food was hard to come by. Kit Harrington, co-founder of Fiddleheads Forest School and founder of the Washington Nature Preschool Association, says foraging comes naturally to children. “It’s something children are drawn to almost immediately within the outdoor classroom,” she says. Foraging has seen an upswing in popularity in recent years. It has been shown to be a tool in the larger effort to stem food insecurity and an unlikely source of safe food in urban environments. But it’s not without its challenges. In some cities, it is actually illegal to pick wild plants. And of course, when it comes to kids putting things in their mouths, it is vital that they understand that some wild plants are poisonous. Harrington sees foraging as an important part of outdoor education, but recommends that teachers do a risk-benefit analysis to determine whether it makes sense in a particular outdoor classroom. “We need to make sure that there’s enough structure around the activity so that children aren’t likely to engage with it in an unsafe way,” she says. And adult supervision is key. Grippo believes in modeling safe behavior. She doesn’t only focus on edible plants in her interactions with the kids, but on poisonous plants as well. But Coates promotes caution. “Tensions come in when you think about edible plants, like fungi, where there’s a risk,” she says. The students she’s seen learn never to eat fungi or put them near their mouths, because it’s just too hard to be sure. And Coates says that teachers make sure to use the word “fungi” instead of mushrooms, to prevent children from becoming afraid of the edible mushrooms at the grocery store. At the Secret Forest Playschool in Duluth, Minnesota, students, who are between three and six years old, set around 100 taps on maple trees every March and then learn how to turn sap into syrup. Not only does it teach them where maple syrup comes from, but they also learn how not to overtap the trees. And when the wild raspberries in the area get eaten by local wildlife before they can pick them, Secret Forest’s founder and director Meghan Morrow says it offers an important lesson, too. “It teaches them that it’s a shared forest,” she says. The Flying Deer Nature Center, which has locations in upstate New York and western Massachusetts, also makes sustainability a key part of the lesson plan. They have programs for children from ages four to 17. 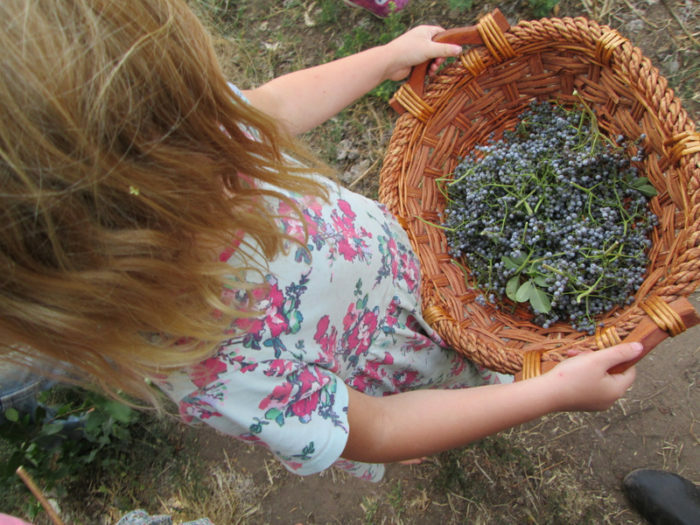 Julie Kunz, one of the instructors who teaches four, five, and six year-olds, will sometimes plan a lesson around a specific plant to forage, such as the autumn olive, a little berry that grows on a shrub. Although they are an invasive species in upstate New York and western Massachusetts, they’ve become part of the local landscape—and they’re packed with vitamin C. So Kunz makes sure the children harvest them consciously, both so that they keep growing back in the area they are in, but also so that they are not taking seed and spreading into new areas. Autumn olives are sour and, like many wild edibles, can be off-putting to children initially. “Our palates are not necessarily used to the flavors that nature gives us,” says Kunz. However, she adds, most kids will try new things when doing so is modeled for them by adults they trust, and when other kids are partaking as well. Sometimes it’s the parents that need more convincing than the kids themselves. Kunz remembers one day being out with a group of kids and finding an insect on a plant called golden rod. The larva of this insect, she says, tastes like butter and can be eaten alive. A few of the kids wanted to try it. “I was so impressed!” she says. But shortly after, she realized that one of the kids who had eaten one was a vegetarian. “I told the dad and he was like ‘uh, we don’t eat animals,’” she said. Overall though, parents appreciate the unique outdoor experiences their children have at their forest schools. Nathan Clay, the father of Leo who spent two years at Wild Roots, says his son’s time there helped make Leo self-assured and has given him a deep appreciation of and wonder about the natural world.